Following Wednesday’s breakdown of the yen to dollar chart, when we finally breached the 94 floor on the daily chart, as risk aversion galloped back into the market, yesterday’s candle provided a measure of profit taking ending the day marginally higher and with a relatively upper wick to the body suggestive that prices are likely to fall further in due course. Indeed in today’s trading the dollar to yen is currently trading at 92.2 and rapidly approaching our next interim target of 91, a level not seen since mid March. Should this price target be achieved then we may well see a re-test of the congestion area of February where prices consolidated in the 88 to 89.50 region. The only item of fundamental news on the economic calendar for Japan is the Domestic CGPI (Corporate Goods Price Index) which is released by the Bank of Japan and on this occasion indicated that producer prices fell at a record pace in June. The news for the US is covered on the main Eurodollar site. 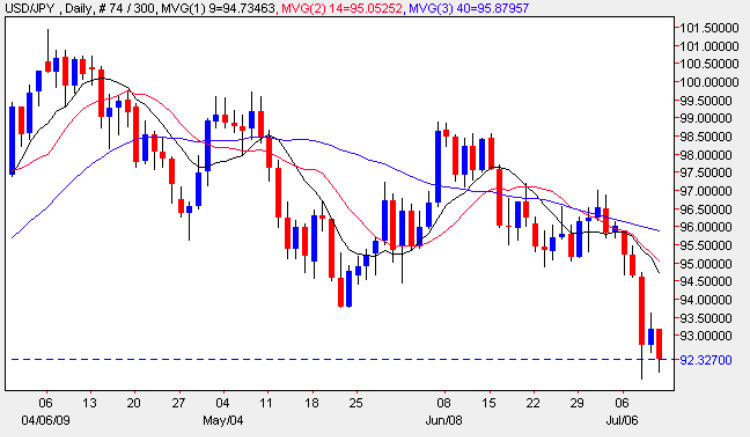 The key to the Dollar falling further against the Yen will depend, in part, on the market’s attitude to risk – if risk aversion continues then we should be able to trade the short side with confidence in this pair as well as the Yen crosses.